The Murray River is the third longest navigable river in the world, after the Amazon and the Nile. 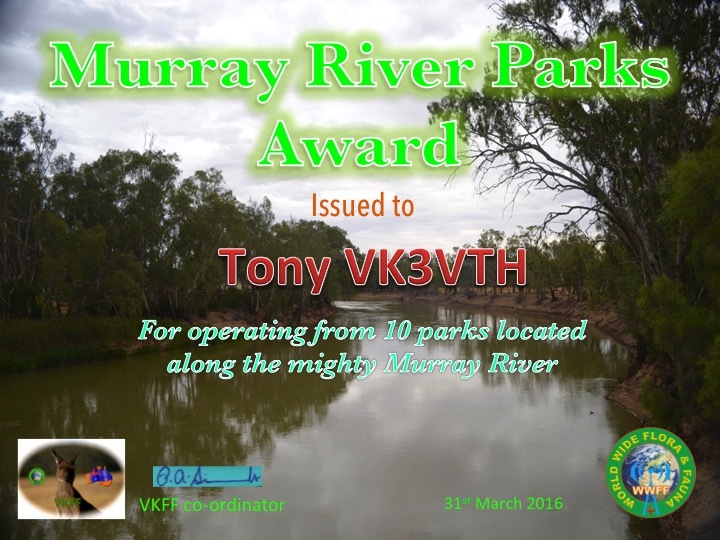 The total length of the Murray is 2,520 km from its source in the Upper Murray and the Koscisusko National Park. It spans three States: Victoriam New South Wales, and South Australia. 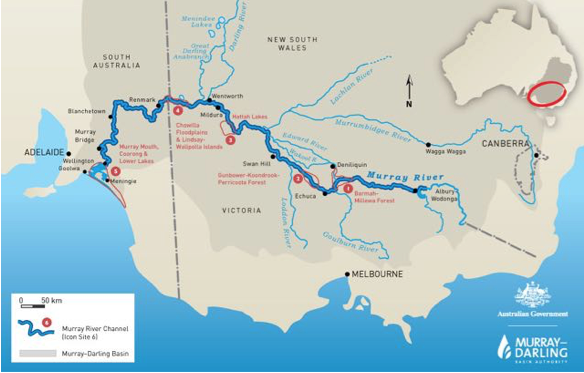 The Murray is continuously navigable for 1,986 km from Goolwa in South Australia to Yarrawonga in Victoria. The Murray is the major domestic water supply for over 1.5 million households, and has 4 major dams, 16 storage weirs and 15 navigable locks. 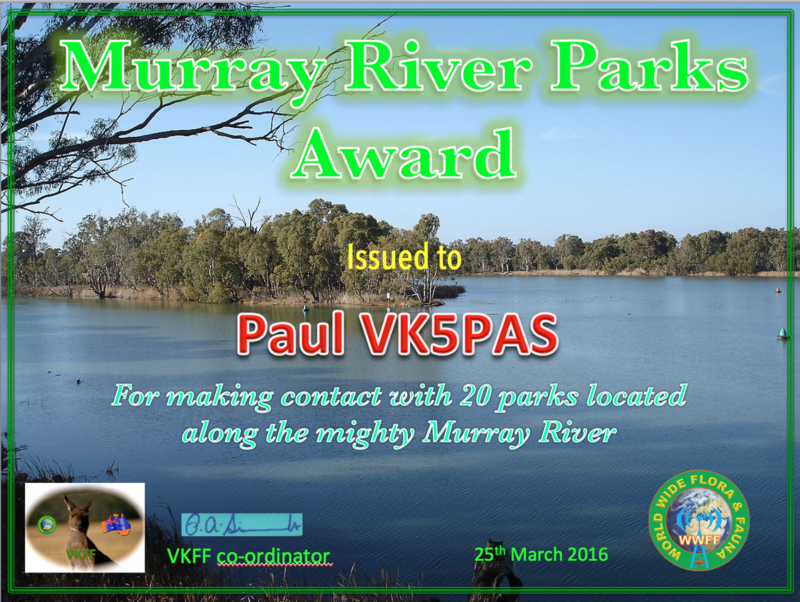 There are a total of 72 qualifying parks for VKFF lying along the banks of the mighty Murray River, or in very close proximity to the River. 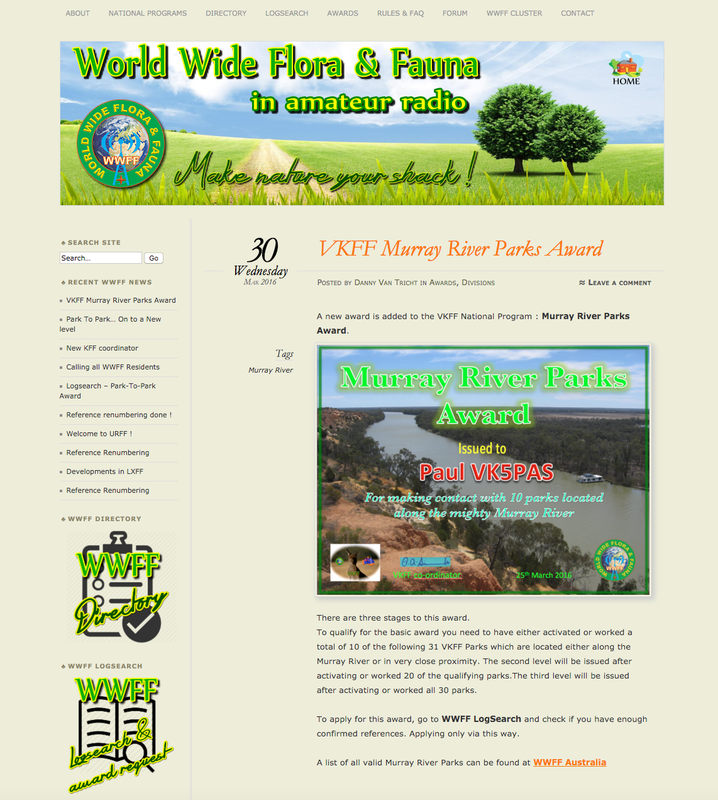 A total of 36 of the parks are located in Victoria (VK3), 24 of the parks are located in South Australia (VK5), and 12 are located in New South Wales (VK2). There are seven stages to this award. 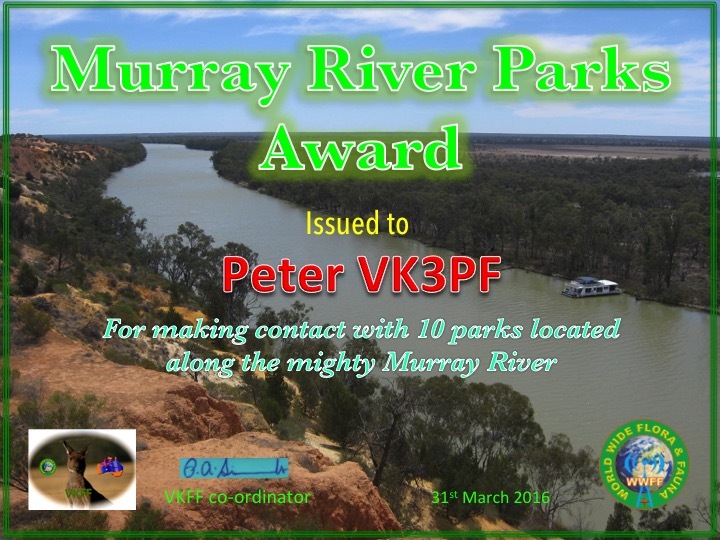 To qualify for the basic award you need to have either activated or worked a total of 10 of the following 72 VKFF Parks which are located either along the Murray River or in very close proximity. The second level will be issued after activating or worked 20 of the qualifying parks. ​The third level will be issued after activating or worked 30 of the qualifying parks. The fourth will be issued after activating or worked 41 of the qualifying parks. The fifth will be issued after activating or worked 51 of the qualifying parks. The sixth will be issued after activating or worked 61 of the qualifying parks. The seventh and final level will be issued after activating or worked 69 of the qualifying parks (currently excluding Mallee Cliffs and Ngaut Ngaut). ﻿Please note that Mallee Cliffs National Park VKFF-0302 and Ngaut Ngaut Conservation Park VKFF-1069, are currently NOT able to be accessed by amateur radio operators. They will remain on the list, as in future, it MAY be that access will be allowed.